Slugger Lee Seung-yeop has rejoined his former team in South Korea's top baseball league. Korea Baseball Organization (KBO), the club announced Monday. The left-handed first baseman agreed to 800 million won (US$707,960) in salary plus another 300 million won in a club option. Lee is back in the KBO after spending eight seasons in Japan's Nippon Professional Baseball (NPB) with three different clubs. In his last KBO contact, he was paid 630 million won per season. "I didn't think I would ever come back, and I can't describe how happy I am to be returning," Lee said through the team's press release. "The Lions are my home at heart, and I felt terrible when I left for Japan." Lee was born in Daegu, the home of the Lions, located about 300 kilometers southeast of Seoul. The Lions won the KBO championship this year, and Lee said he was looking forward to teaming up with new players for another run at the title. He put together a Hall of Fame career with the Lions from 1995 to 2003. Lee won five Most Valuable Player (MVP) awards and led the KBO in home runs five times and in runs batted in (RBI) four times. In 2003, he established the KBO's all-time single season record with 56 home runs and 144 RBIs. The 35-year-old is ranked fourth with 324 career home runs, just 27 behind the all-time leader Yang Joon-hyuk, who is retired. In Japan, Lee has played for the Chiba Lotte Marines, the Yomiuri Giants and finally the Orix Buffaloes. He enjoyed some success early on before nagging injuries derailed his career over the past four seasons. 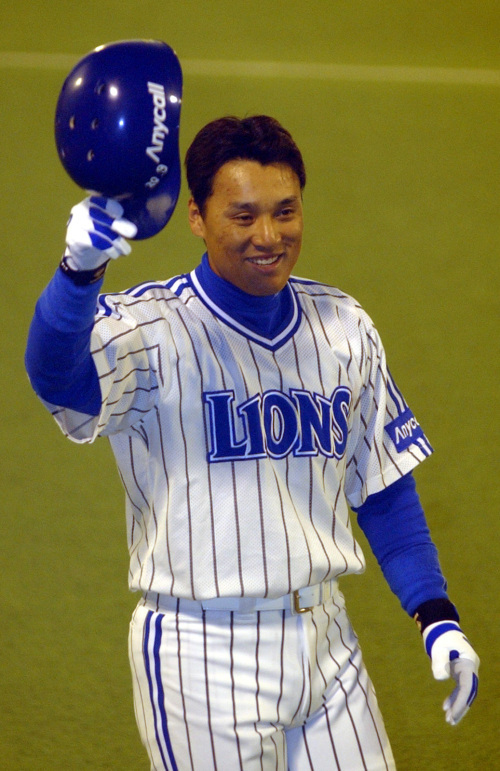 In eight Japanese seasons, Lee hit .257 with 159 homers and 439 RBIs. '라이언 킹' 이승엽(35)이 총 11억원을 받고 '친정'인 프로야구 삼성 라이온즈에 8년 만에 복귀했다. 삼성은 이승엽과 1년간 연봉 8억원, 플러스 옵션 3억원 등 총 11억원에 계약했다고 5일 발표했다. 2004년 일본프로야구 지바 롯데에 진출했던 이승엽은 2003년 연봉 6억3천만원을 받았고 8년 만에 컴백하면서 연봉이 1억7천만원 올랐다. 김인 삼성 라이온즈 사장은 이날 오후 서울 구단 사무실에서 구단에 연봉 협상을 위임한 이승엽을 만나 계약서에 도장을 찍고 새 식구의 귀환을 환영했다. 이승엽이 내년 시즌 좋은 성적을 올려 무난히 옵션을 따낸다면 프로야구 선수로 는 한 해에만 역대 최고 금액을 손에 쥘 것으로 보인다. 그러나 한화 이글스가 역시 일본에서 돌아온 주포 김태균(29)에게 연봉 10억원+ α를 제시한 이상 순수 보장 금액은 김태균에게 밀릴 것으로 예상된다. 이승엽은 구단을 통해 "다시는 못 돌아올 줄 알았는데 복귀한다는 생각에 말 못 할 기쁨을 느낀다"면서 "삼성은 마음의 고향으로 일본으로 떠날 때 죄송한 마음이 가득했다"면서 보답할 기회를 준 구단에 고맙다는 뜻을 나타냈다. 이어 "올해 우승을 이끈 후배들과 함께 잘 조화를 이뤄 팀이 더 강해질 수 있도록 하겠다"고 각오를 다졌다. 경북고를 졸업하고 지난 1995년 삼성에서 데뷔한 이승엽은 2003년까지 9년간 통 산 타율 0.305를 때리고 홈런 324개에 948타점을 남겼다. 일본에서는 지바 롯데와 요미우리, 오릭스 버펄로스 등 세 팀을 거치며 통산 타율 0.257을 때리고 159홈런에 439타점을 기록했다.